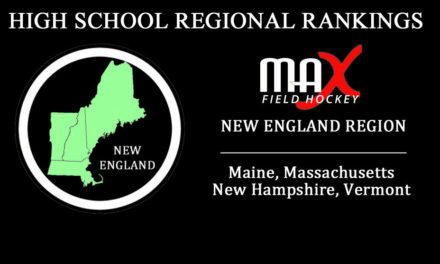 Andover High School (Andover, Massachusetts) claims the #1 spot in the Final New England Region Rankings for the 2017 High School Field Hockey season. The Warriors finished 22-0-1 as the MIAA Division I State Champions, North Division I Champions, and Merrimack Valley Conference Division I Champions. Outscoring opponents 95-11 and registering 12 shutouts throughout the season, Andover was dominate in both regular season and postseason play. 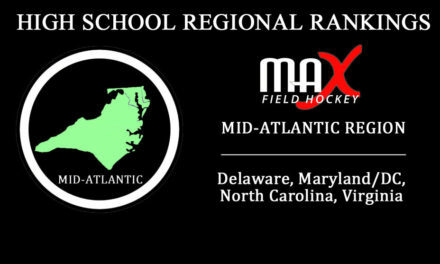 Head Coach Maureen Noone’s squad played one of the toughest schedules in the region and secured wins over six of the teams in our final regional rankings (#2 Winchester, #7 Longmeadow, #10 King Philip, #15 Central Catholic, and OC Walpole). The Warriors claimed their 3rd state title in school history with a 2-0 win over #7 Longmeadow in the championship game. Hanna Medwar and Julia Carzo scored the goals and their defense didn’t allow a single shot all game. In addition to our Final Top 20 Rankings, we also wanted to recognize the state and major conference champions from the New England Region. Congratulations to the following 2017 New England Region State/Conference Champions! State, conference and local postseason player and coach awards are being compiled on the High School Player Awards page. We will continue to update these are they are released. Please email any missing awards to admin@maxfieldhockey.com.